Ski Amade is an association of skiing areas in Salzburg and neighbouring regions. Ski Amade is the biggest skiing area association of its kind in Austria and provides access to extensive numbers of slopes, lifts and other important skiing facilities. Skiing areas that are members of Ski Amade are not allowed to issue local tickets, but solely the general tickets that entitle customers to use ski lifts in the entire Amade region. For the consumer (you), this has advantages and disadvantages: Due to the sheer size of the association, Ski Amade and the Salzburger Sportwelt (its historic core) have a reputation for excellent facilities, enormous skiing opportunities and professional staff; on the other hand, the skiing tickets of the Ski Amade regions are pretty expensive even by Austrian standards. The Ski Amade area claims to be the largest skiing region in Europe and among the largest in the World. There is a total of 270 lifts covered by the tickets. These lifts provide access to 860 kilometres of slopes, in total some 360 of them. 80 percent of the slopes in Ski Amade regions can be maintained with snow guns even in years with very little snow. All in all, the lifts of the Ski Amade regions can transport 350,000 people per hour. There are more than 90,000 guest beds available in the communities that are part of the Ski Amade association, about 10 percent of Austria′s total number of hotel beds. About eight percent of the country′s hotels and B&Bs (approximately 5,400) can be found in the Ski Amade region. The Ski Amade area is well-accessible from Salzburg and its densely populated surroundings. Many hotels offer shuttle services from Salzburg Airport and even tourists that stay in the city can take the Snow Shuttle, a winter bus service, from the capital to the mountains. 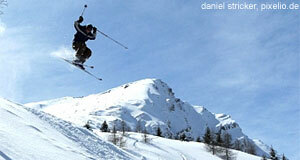 Ski rental services make sure that you don′t need to take your own gear to the plane. Historically, the Ski Amade region was formed by merging previously existing skiing areas of Salzburg. This was due to general trends towards consolidation and due to increased competition from skiing areas in Eastern Europe since the early 1990ies. Among the skiing areas that are member of the the Ski Amade area you will find some of the most highly regarded Austrian ski regions outside of Tyrol and Vorarlberg: The Salzburger Sportwelt (northern and central Pongau area); the area Schladming-Dachstein Tauern (Tennengau and neighbouring Styrian Salzkammergut around Mount Dachstein); the Großarltal (a valley around Großarl in the southern Pongau); the neighbouring Gasteinertal; and Hochkönigs Winterreich (Western Pongau and neighbouring Pinzgau area around Mount Hochkönig, famous for its glacier).